JAMMU, Sept 4: Former legislator and senior BJP leader, Ch. 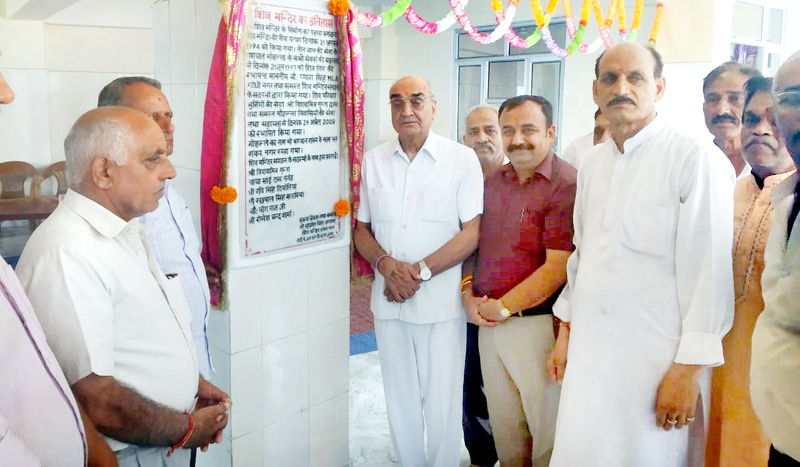 Piara Singh, along with MLC, Vikram Randhawa inaugurated a community hall at Shankar Nagar, Narwal today. Construction of the community hall was started way back in June 1997 by the former legislator, Piara Singh, which now stands completed and was today inaugurated. On this occasion, the local public hailed Singh for personally bearing entire construction expenditure of the community hall without any Government funding. Speaking on the occasion Singh said that he has served the people of the constituency irrespective of caste, colour and creed and has taught the same to his politician son now MLC, Vikram Randhawa. Randhawa while speaking on the occasion assured the people that he will continue to serve the people like his father with the same dedication and honesty. He assured to carry forward the legacy of his father. Those who were present on the occasion included Vishwa-mitar Gupta, Sain Dass, Madan Lal Dubey, Surjit Singh, Ravi Singh, Rashpaul Singh, Ch. Yog Raj, Ramesh Sharma and others.